Wigan Athletic’s away-day misery continued with a 4-2 hiding at Sheffield United, with hat-trick hero Billy Sharp doing most of the damage for the table-topping Blades. United took the lead midway through the first half when former Latics striker Leon Clarke’s shot - which looked as though it may have been off-target - was diverted into his own net by the unfortunate Chey Dunkley. And Latics suffered a further blow on 37 minutes when Gary Roberts limped off with what looked to be a hamstring problem. However, his replacement, Kal Naismith, took only two minutes to level the scores, with a cool finish at the far post from Nathan Byrne’s cross. The Blades regained the advantage just before half-time when Sharp found himself in acres of space to steer past the helpless Christian Walton. 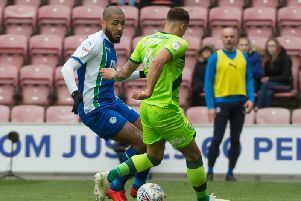 Only a superb challenge from Antonee Robinson prevented David McGoldrick making it 3-1 seconds later, but the respite for Latics was only temporary. Sharp added his second goal eight minutes after the restart when he produced a clinical finish to Clarke’s inviting left-wing delivery. And the Blades skipper completed a brilliant hat-trick just after the hour mark when he was again the first to react in the box, to flick the ball over the exposed Walton and into the net. Latics reduced the arrears to 4-2 with 21 minutes still to play when Joe Garner scored his first goal for the club, after good work down the right by Josh Windass. Despite Reece James forcing United goalkeeper Dean Henderson into an superb late save, the Blades rarely looked in danger of being pegged back, and now proudly sit top of the Championship. Freefalling Latics are now down to 13th position, with just the small matter of Leeds United and Middlesbrough to come before the next international break. Having made four changes - Robinson, Byrne, Roberts and Powell for Cedric Kipre, Naismith, James Vaughan and the ineligible Lee Evans - Latics started by far the brighter. Windass cut in from the left and had a shot deflected wide for a corner, before the forward - being watched from the away end by proud father, Dean - was felled right on the edge of the box. Roberts saw his blistering set-piece tipped over, before sending over the resulting corner that was headed inches wide by Dunkley. However, after doing everything but break the deadlock, Latics were rocked on their heels as the home side nosed in front thanks to an own goal by Dunkley. Powell’s attempt at an immediate response flew just past the post, but Latics were level before half-time when Naismith - on for Roberts - slotted home from close range. Unfortunately, Latics couldn’t see out the rest of the half, with Sharp putting United back in front with a cool finish. And only a fabulous chase and block from Robinson prevented McGoldrick making it three within seconds. The Blades duly picked up where they’d left off after the restart, with Clarke forcing a brilliant save from Walton. At the other end, a rare moment of danger from Latics saw Robinson’s cross pick out Powell, whose header flew just over the top. However, United were seeing more and more of the ball, and it was 3-1 when Clarke isolated Dunkley down the left, and crossed for Sharp to beat Burn and smash past Walton. Callum Connolly was withdrawn for Garner to try to tip the game back Wigan’s way, but the visitors’ task soon became virtually impossible when Sharp reacted quickest to a loose ball to flick over Walton for 4-1. Wigan’s misery was compounded with the sight of Powell limping off after a heavy challenge, but substitute Callum McManaman at least sparked some life into the side with a couple of energetic runs. Garner managed to pull one back just after the three-quarter mark with a fine volley from Windass’ cross. And there might have been a dramatic climax had full-back James’ superb free-kick found the roof of the net rather than being tipped over by Dean Henderson. But the Blades were able to see out the rest of the game with relative comfort, and indeed almost found a fifth goal only for Jack O’Connell’s header, from Oliver Norwood’s cross, to smack against the bar and away to safety.